Graybeard Outdoors > Black Powder Forums > Blackpowder Mortar and Cannon Sponsored by Seacoast Artillery > Is this a mortar carriage in the background? Is this a mortar carriage in the background? 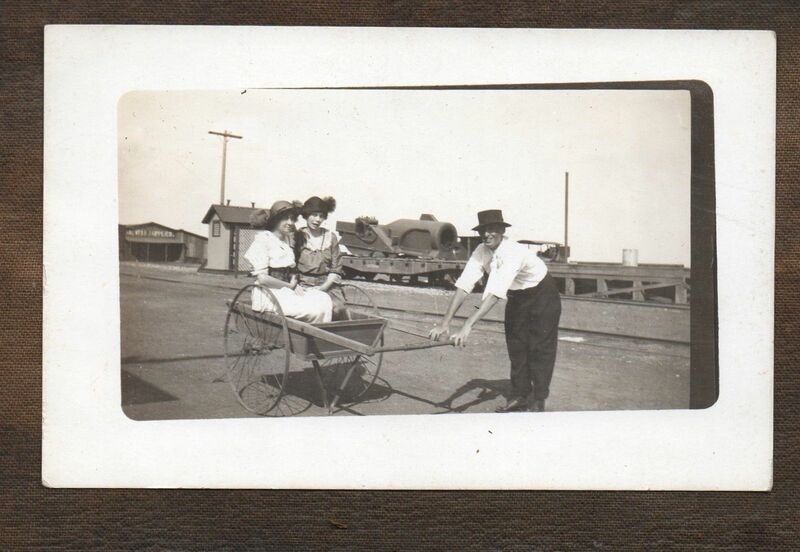 Someone emailed me this photo, asking if that's a mortar mount on the flatcar in the background. I don't think it is, but I got to wondering. "When all else fails, call for indirect fire on your position, AND GET THE **** OUT!" -Exact words of one of my 'call for fire' class instructors. Former US Army Ordnance officer and lover of all things what go BOOM! Don't think it is a mortar. Looks like a very large wheel at the left end, and above that is some sort of operator station with control levers. The large round snout may be part of a firebox for a steam engine with the boiler to be extended to the right of that. Possibly a locomotive or steam roller or steam shovel. Maybe a large piece of dredging equipment. But, not a mortar, at least in my opinion. Do not know for sure what it is. But surely not a Mortar. My bro is into railroad history (besides being a licensed steam engineer)... He doesn't know. A source for the photo? Any hints? My brother estimates the photo to 1915. I'll guess a roller for railroad bed??? That thing is big, I gotta think railroad, ships, or steel mill. Beats me on the details, you all have what I have. The mount itself sort of suggested maybe a mortar bed of a late 1800s type, but there wasn't any way for me to be sure. I just don't have any books that show each US mortar bed through that timeframe. The 'tube' looking thing almost looked it had rifling but I couldn't tell for sure. The back end looked odd, as it tapered down at the back end (or what looks like the back). It doesn't look like any RR equipment I've ever seen from that timeframe, though. Connector for some sort of piston? Fitting for Steam powered hammer mill or donkey engine? Last edited by double d; 01-31-2019 at 04:52 PM. I put this photo up on a railroad board and you can see what they think it might be at this address: Narrow Gauge Discussion Forum. Put those guys with us guys and we figure it out.